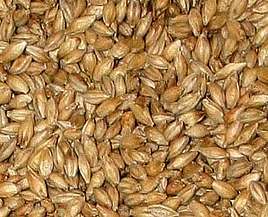 Barley malt is the base product of single malt whisky production. This article deals with the production of malt and the necessary equipment and rooms. If you aren’t familiar with the basics of single malt whisky production you can read this article first. Newly harvested barley grains can’t be processed into beer or whisky straight away. 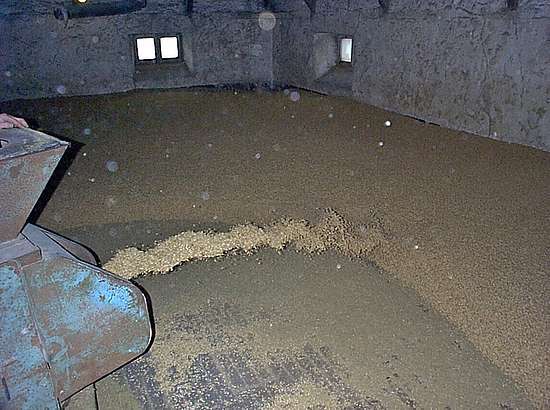 The starch contained in the barley grain must first be split into sugar before the yeast can start fermentation. The article ‘From the Grain to Alcohol’ contains detailed information on the chemical processes involved. Although the production of barley malt always includes steeping, germination and drying, two different production methods have emerged. Today the bulk of the malt used in whisky production is produced in drum maltings according to exact specifications of the distilleries. What you read here is a look into the past. 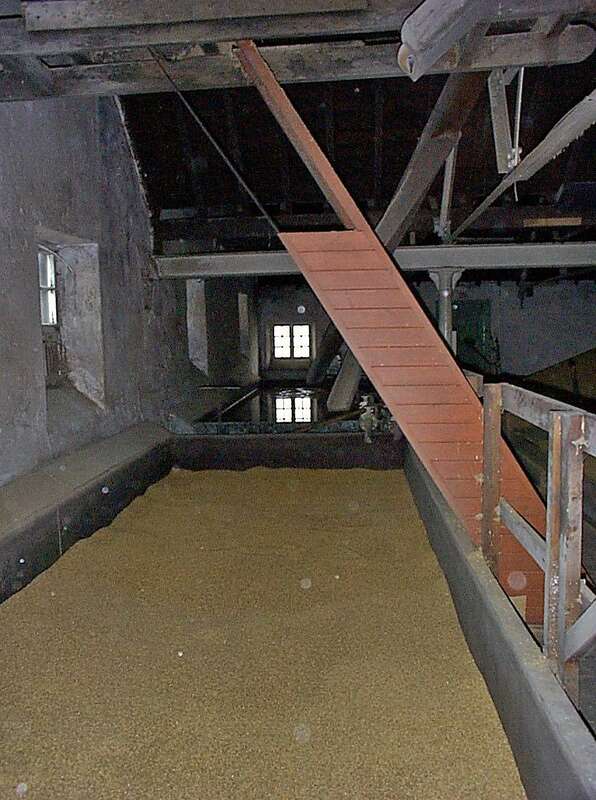 Below you can see pictures of different maltings. 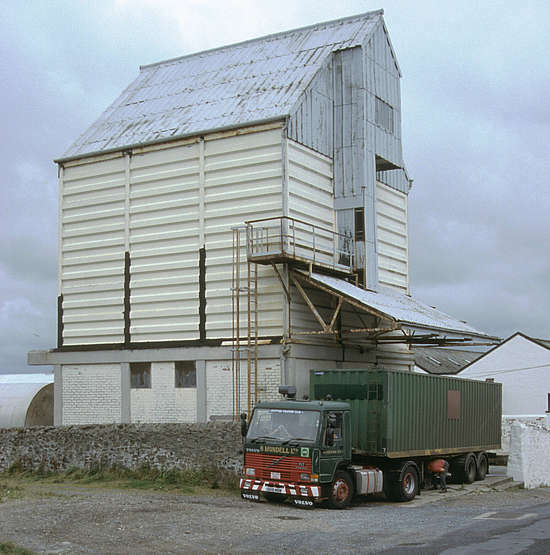 By 2010 only Tamdhu still had the Saladin boxes, in which a lot of malt can be produced in one batch since the malt layer can be up to 1 metre high. With its Saladin boxes, Tamdhu produced the malt for Macallan, Glenrothes and other distilleries in the corporate group. 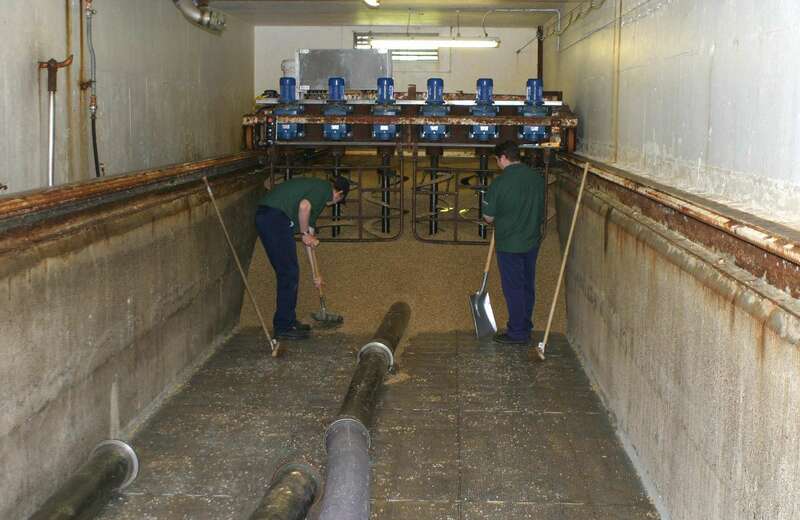 All other operating small maltings use simple malt floors and produce only little malt. Whenever you see photos of Tamdhu here, keep in mind that they had large-scale maltings. 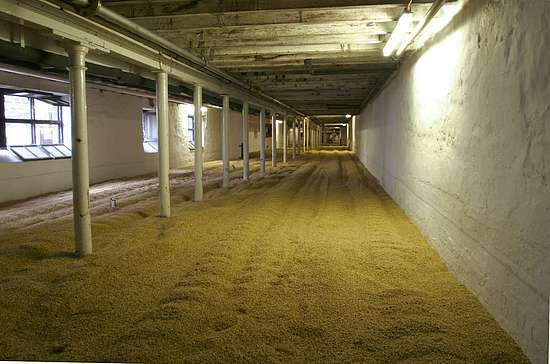 Over a hundred years ago the distilleries (and the breweries) had only malt floors to let their barley germinate into malt. The first automation step were the Saladin boxes, which automated the germination of the barley but didn’t bring any advantages for malt drying. Today the industry uses drum dryers, which we won’t deal with further here. Only few distilleries have their own, small maltings. 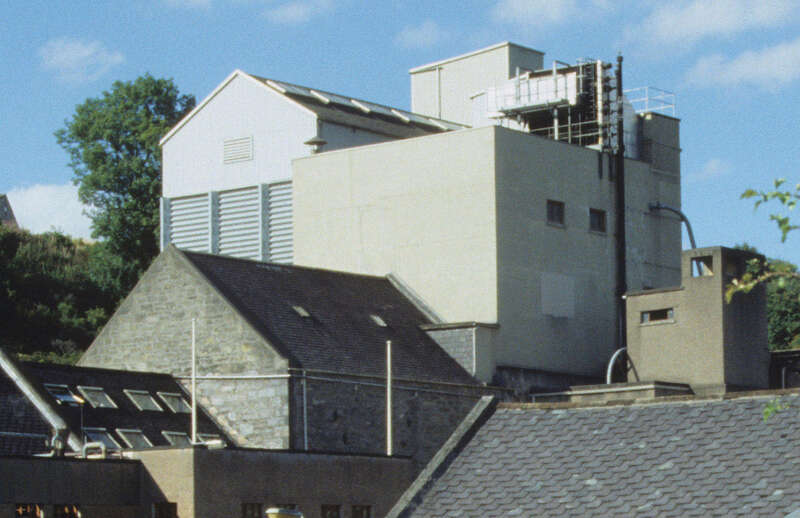 Although they’re regarded with awe and seen as especially authentic, the malt from these maltings costs the distilleries a lot more than industrially produced malt from specialised large-scale maltings (e.g. 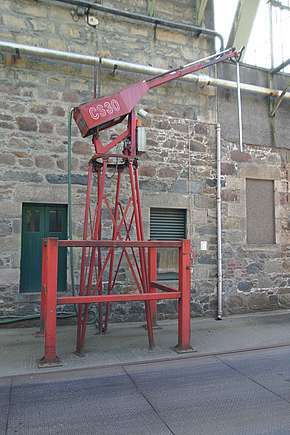 Port Ellen). Today barley is grown in many countries in the temperate zone. For a long time now, the Scottish barley production hasn’t been able to meet the demand for whisky and beer. 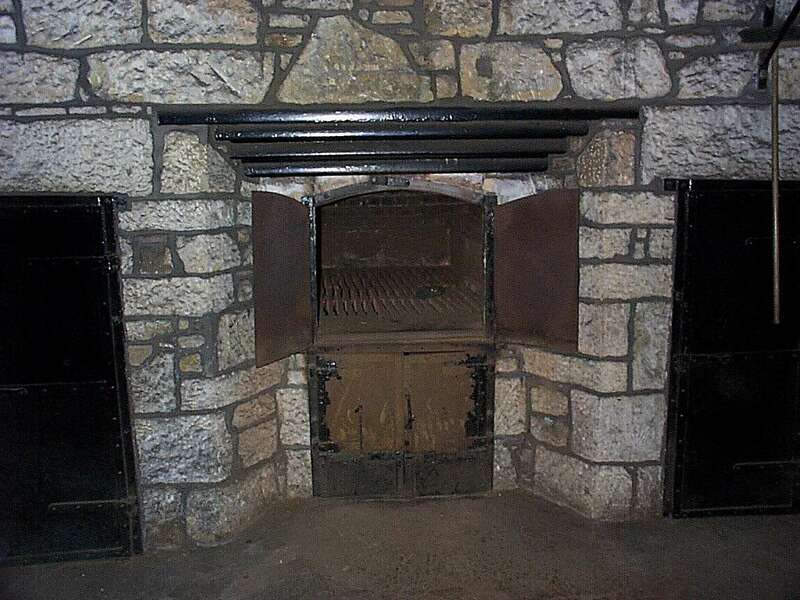 Thus Scotland imports parts of their barley but also finished barley malt from many countries such as Germany. For producing barley malt, the barley grain is put in an ideal, warm and damp environment in order to make it germinate. The inevitable happens: The grain activates the solar energy it has accumulated on the field and converts the starch into sugar. The barley grain is like a small factory and wants to convert the sugar into cellulose in order to grow roots and a germ with leaves. However, after the starch is converted into sugar the process is interrupted. The malt is dried, and the malt sugar (maltose) is used to produce a sweet liquid called wort. First the malt is ground coarsely, then the sugar is dissolved with hot water, and eventually left to ferment by adding yeast. After that, it’s time for distillation. 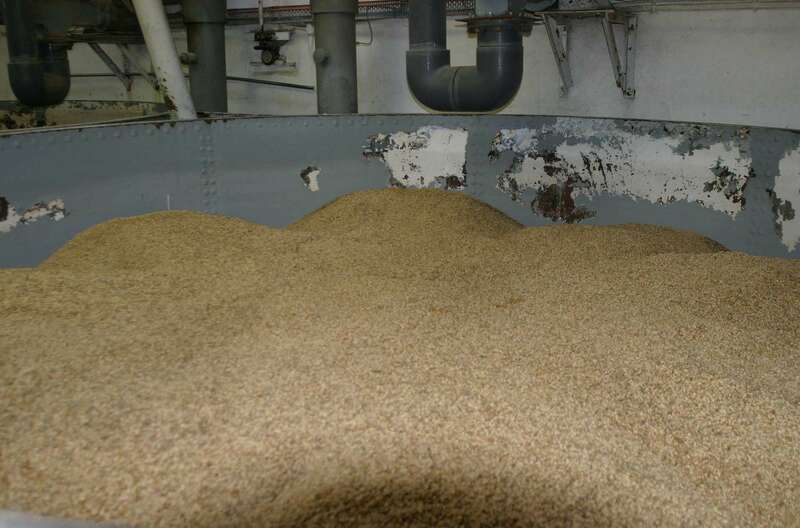 Today barley is transported to the distilleries by fully loaded 40-ton trucks. It doesn’t matter if a distillery doesn’t have its own malting anymore. 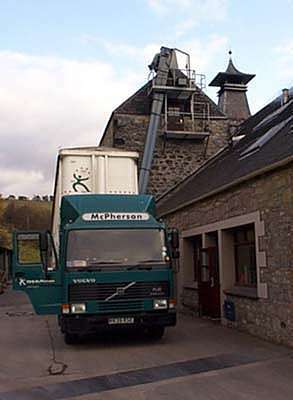 In this case, the trucks deliver finished malt. 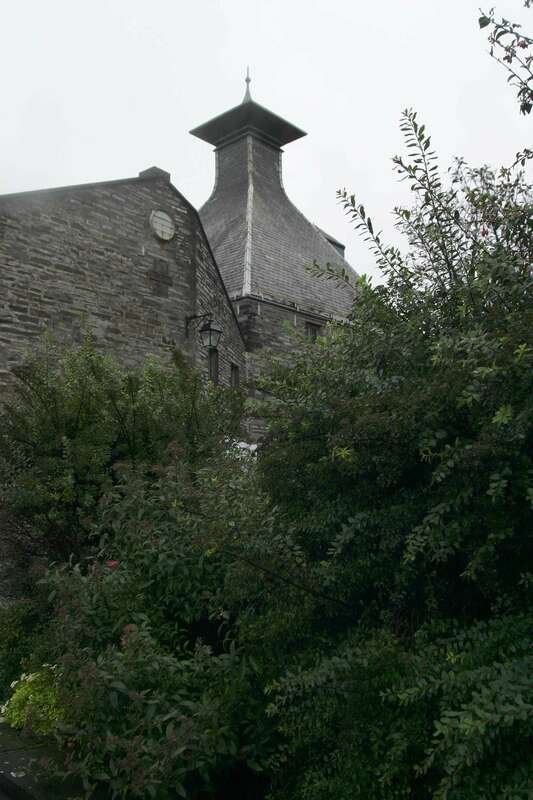 But we’re dealing with the rare cases of distilleries with their own maltings, of which there are now only less than 10: Balvenie, Bowmore, Glen Garioch, Glen Ord, Highland Park, Laphroaig, Speyburn and Springbank. Apart from Speyburn and Glen Ord with their pneumatic drum maltings, the other distilleries only produce parts of the malt they need, mostly for nostalgic/touristic reasons. But which malt is better? The malt from the small, traditional maltings operated by the distilleries themselves or the malt from the industrial maltings? Apart from some journalists, all experts agree. They regard the old-fashioned, human-powered maltings as inferior. Why should it be so? What leads them to this conclusion? 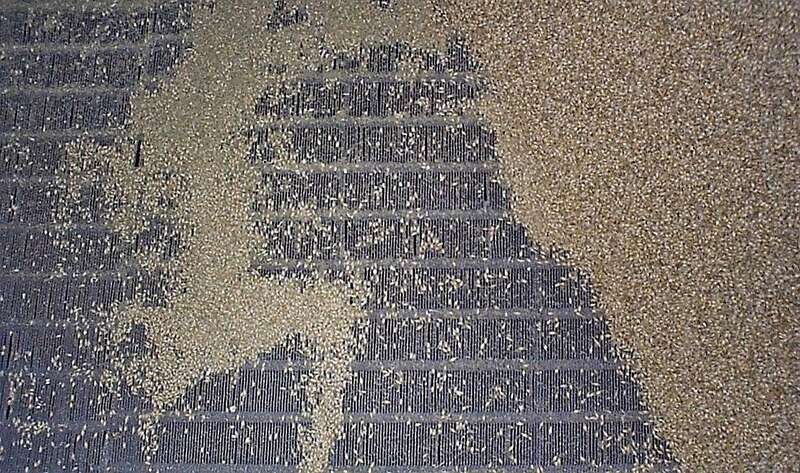 It's extremely difficult and requires a lot of experience to create and sustain an ideal climate for barley to develop and germinate if you only have a simple malting floor. As soon as the weather outside changes, the temperature or the air humidity aren't in the optimal range anymore. And the weather changes frequently in Scotland. The least damage is done if only the germination doesn't start properly and the whole process is just delayed during a weather change. It’s much worse if mould starts to form, and bacteria and fungi grow on the malt floor. Furthermore, mice, rats and cats can drag in dirt. Since single malt whisky is a very traditional product and must remain so, the big distilleries like Highland Park, Bowmore or Laphroaig don't abandon the ancient craft of manual malting. But the strong increase in demand for these excellent malt whiskies has led the distilleries to switch to a three-shift production on seven days of the week. The production is only halted for a few days a year for necessary maintenance. But the change of production to three-shift operation on more than 300 days a year makes it obvious to the traditionally-minded whisky connoisseur that human-powered malting alone isn't possible anymore. The buildings of the maltings were designed for normal 8-hours production cycles, and the existing malt floors couldn't support a tripled output. 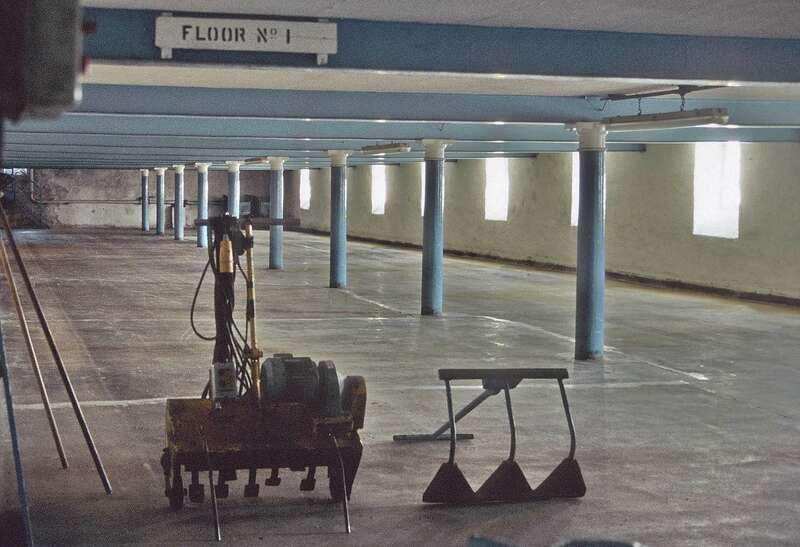 Parts of the old malting floors were also often converted into visitor centres and shops. So we have to deal with the fact that today also the distilleries that have their own maltings can only produce parts of the malt (approx. 15% to 30%) in the classic way - a worthy and beautiful tribute to the old tradition. Before 30 cubic metres of barley can be filled into the silos of the maltings, the distillery must take a sample and assess the quality of the barley. Only if the barley meets certain quality criteria such as density, humidity, starch content, germination ability, nitrogen content and purity, the controller accepts it. The amount of fungi and pests is also checked. A special device, the monkey, is used to take samples from the truck. The whole batch of barley is pumped into one of the silos with compressed air, where it is stored until further use. 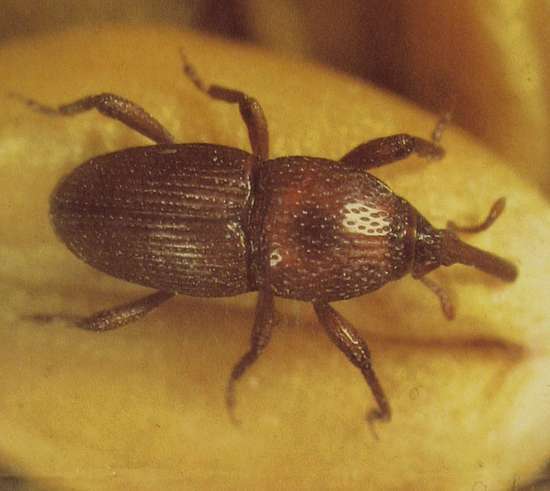 A nasty barley pest is the grain weevil. It hides in the barley and can feed and breed there optimally. Photograph by M. E. Brown, ADAS, Slough Lab. If you've ever bitten on a raw grain you know how hard they are. That's why these grains must be steeped in water for several days before germination. During this time they soak with water, which they need to trigger the germination process. Steeping takes two to three days. Of course the same pure spring water is used as is used for extracting the sugar. 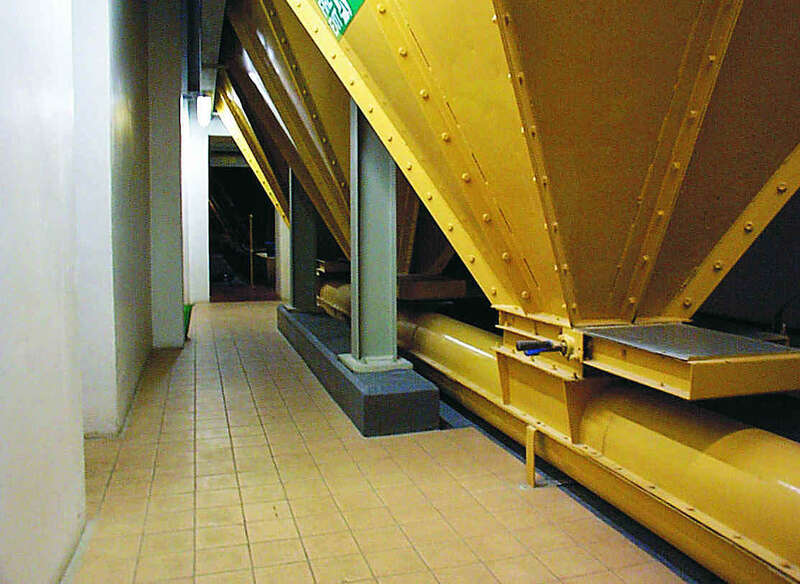 After the barley has been steeped, the further approach in human-powered and industrial maltings differs in terms of automation (malting floors and Saladin boxes respectively). With simple tools such as wheelbarrows and rakes, the steeped barley is spread on the malting floor in a layer of 8 to 12 cm depth. 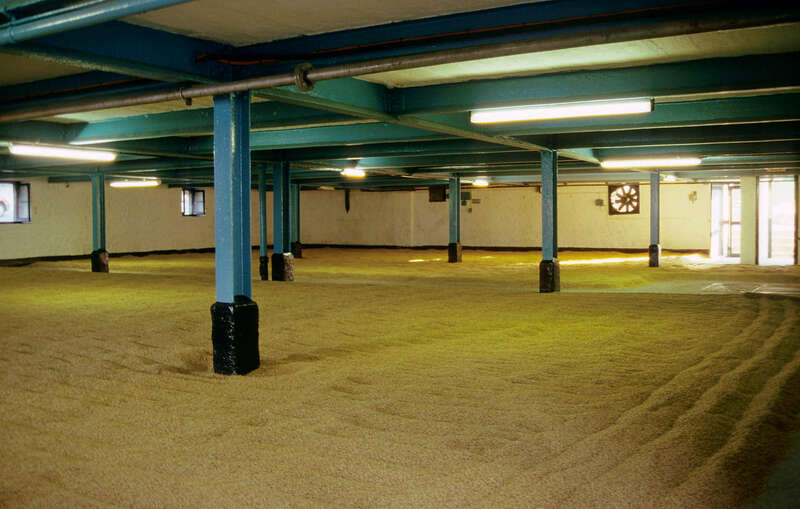 The malting floors must be aired properly so no fungi or bacteria infest the barley. But that's not all. The barley must be turned over regularly since the biological reaction heats up the barley in the middle segment. The maltman makes sure that the barley doesn't overheat by turning it over and stirring it. Still the result remains suboptimal. Even the best maltman must bow to the results of the modern industrial maltings. Speaking of bowing: Most of the turning over used to be done by hand using the malt shovel. After 30 years of turning malt with the shovel, the workers suffered from bone deformities. This work-related disease was aptly called 'monkey shoulder'. Stirring and airing were done completely differently in the Saladin boxes at Tamdhu. 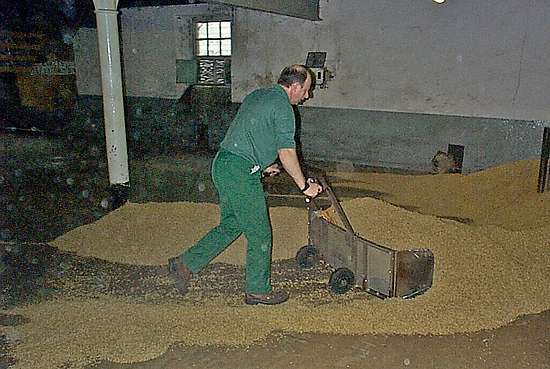 A mechanical turner is moved through the layer of barley, which reaches a depth of up to one metre, along rails at the sides. The grains are steadily mixed by plates that are bended like screws. 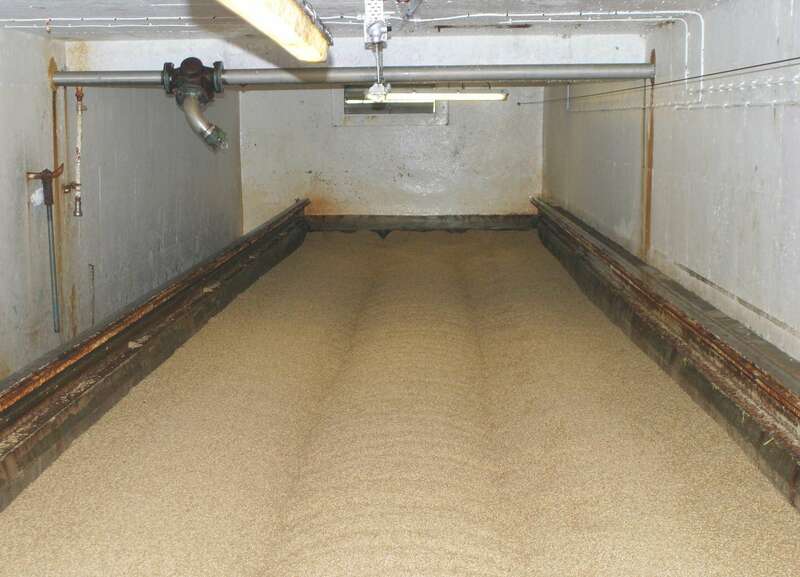 Since temperature and humidity are regulated by air condition, the starch can turn into malt sugar much more effectively than on malt floors. The industrial maltings at Tamdhu had a whole storey full of these Saladin boxes, which were operated 24/7. The Saladin boxes are emptied through the suction tubes seen in the foreground. 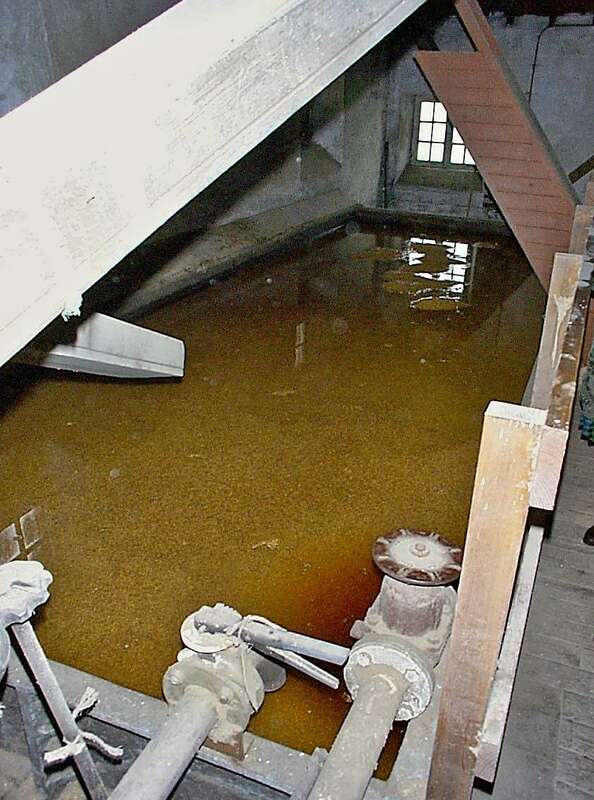 The following drying process is the same in traditional maltings and industrial maltings. 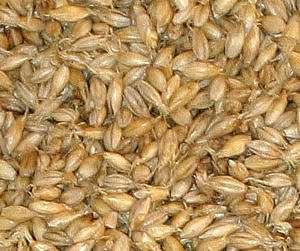 When the barley grain, let's call it malt already, bursts open and its roots start to form the germ, the germination process is stopped since the formation of the germ uses up the sugar from the malt, which is then unavailable for fermentation. The germination is stopped by heating and drying the malt. Heating the malt up to more than 70°C destroys the enzymes (amylases) released by the grain for germination, and drying stops mildew and bacteria from affecting the fresh malt. The still wet malt is spread on a perforated drying floor above a kiln. The floor is often made from a steel wire grid with holes that are smaller than the grains. 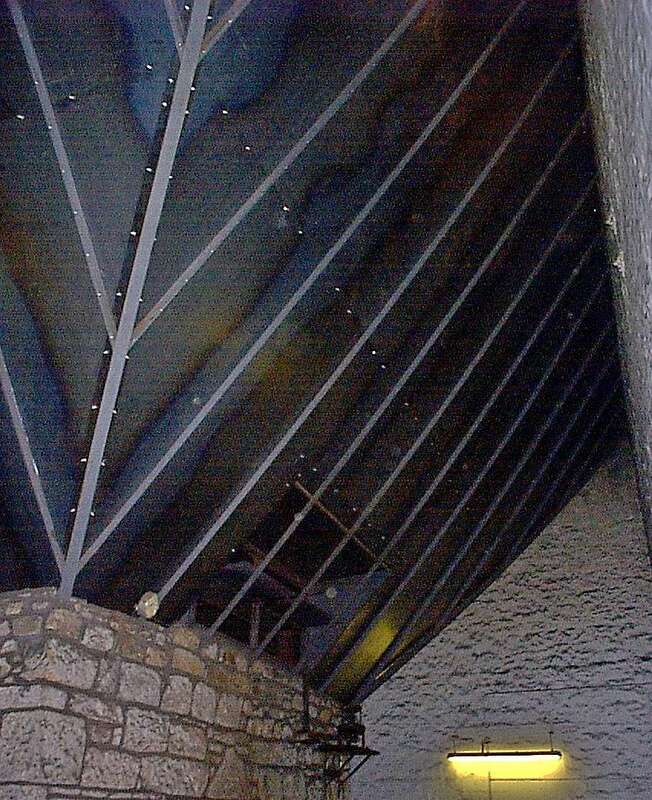 The hot exhaust air from the kiln fire is led through the malt layer and thereby extracts humidity, which escapes through the pagoda-shaped chimneys. You almost cannot enter a drying floor while a fire is burning below. The heat reaching more than 70°C and the extremely high air humidity make breathing almost impossible. Glasses and photo lenses steam up immediately. 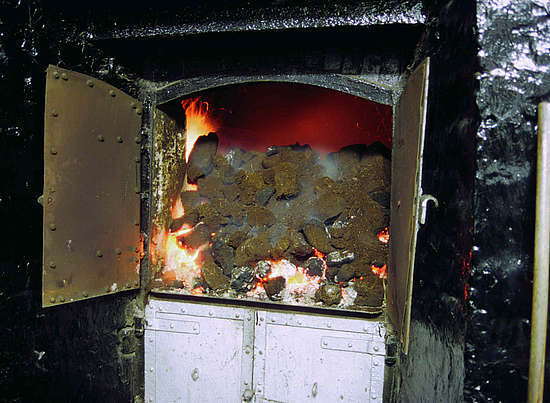 If peat is added to the kiln fire, pungent smoke develops, which provides for the smoke flavour in malt whisky. 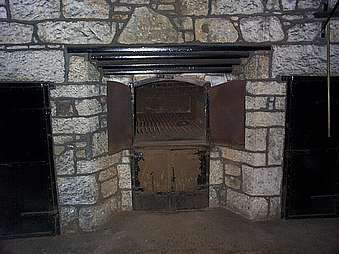 The degree of smokiness of our malt whiskies depends on how long the malt was dried over peat fire and/or normal fire. 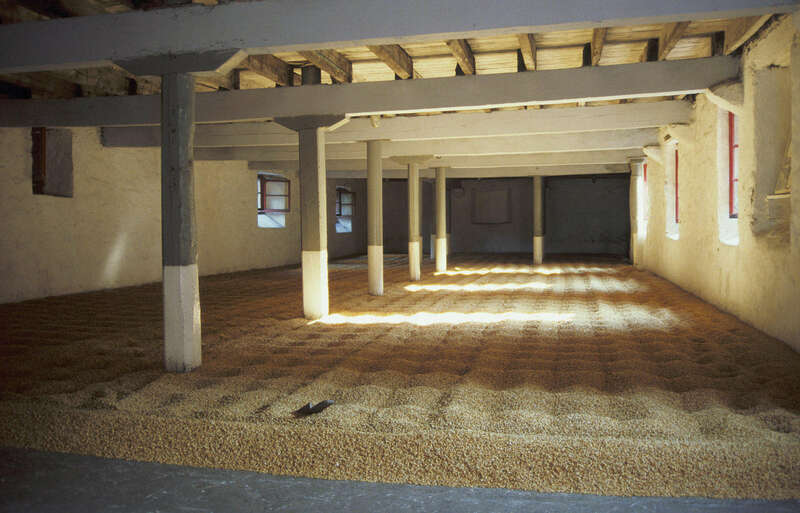 After drying the malt can be kept for several weeks before it is coarsely ground in the malt mill so the sugar can be extracted with hot water. We will deal with this process in an upcoming article.